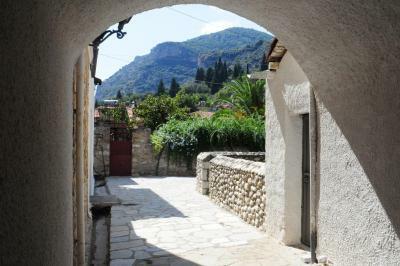 Lock in a great price for Mystras Castle Town – rated 9.5 by recent guests! The hosts were very kind and helpful with local information. The rooms were very clean and comfortable, and an extremely nice and functional common kitchen area was available for use. Each room had a small refrigerator as well. 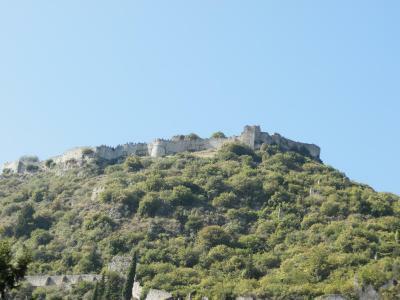 Great location for visiting Mystras and hiking the many trails in the area. The hotel also had its own parking lot next to the building. Nice room, big beds, heating. Free private parking without difficult maneuvers. Nice surroundings, near the little main square. 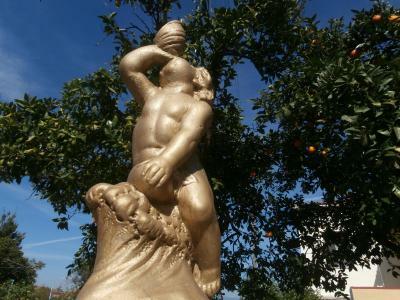 We were given some freshly picked oranges and tangerines for our little son. Delicious! Room was beyond our expectations. Internet worked very well. Ancient Mystras is an amazing Byzantine castle city. The place is very clean, Very friendly staff and nice things to see around, for a couple of days. 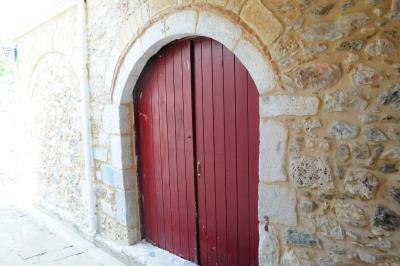 10 metres from shops and cafes. Very welcoming owner, we got a drink on the house. 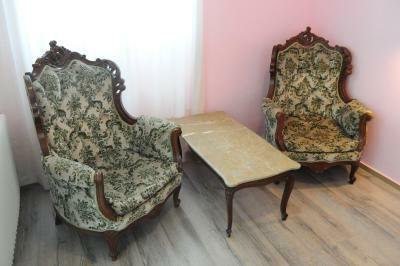 Room was larger than expected for the price and had a couple of big armchairs inside as well as balcony furniture. The location, the view, the hotel has a kitchen which we could use and a parking lot which was a good thing. Owners were most welcoming, helping with luggage and offering a beer, cheese, and olives after we settled in. 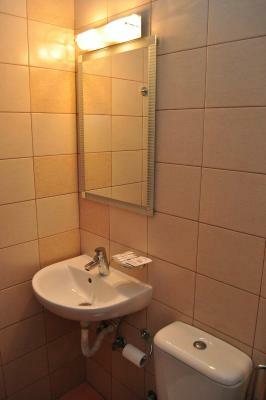 While the place was not luxurious, it is very clean, a great value for the money, and right in the center of town. 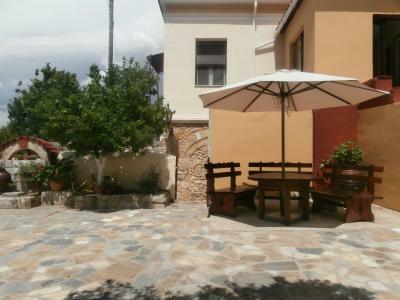 The family apartment has everything one needs, well equiped ,self contained.. Set in a quiet street with a magnificent view of the surrounding mountains and the ancient site of Mystras from the balcony. Parking on site. Hosts Elena and Costas are very welcoming and informative. The owner Elena was very friendly and helpfull. She even offered us a beer. 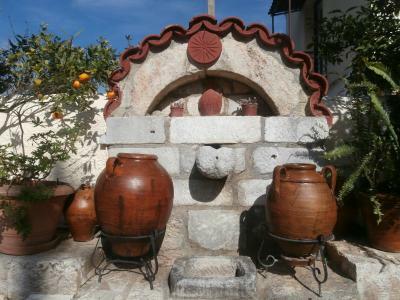 The pension is well located to visit Mistras. 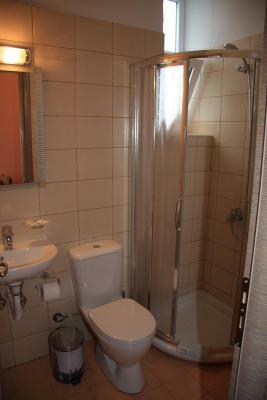 We had a room with kitchenette which was very usefull since breakfast is not included. There is a beautiful garden with tables and chairs to relax. The place was pretty much perfect and is one of the cleanest hotels I've ever stayed in. 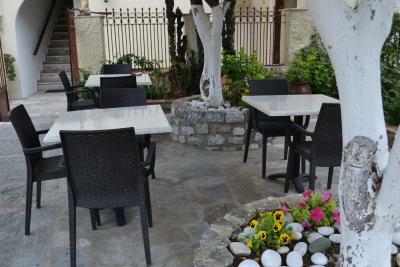 One of our best sellers in Mystras! Set amid greenery, Mystras Castle Town is located in Mystras, just 100 feet from the central square. It offers air-conditioned accommodations, some with mountain views from their balcony. 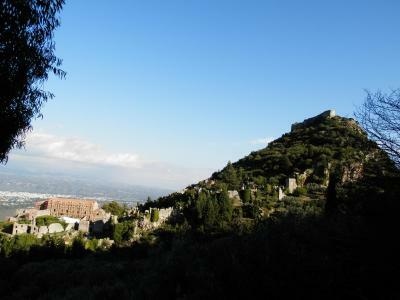 The famous castle of Mystras lies within 0.6 mi. Simply decorated with dark-colored wooden furnishings, all units at Mystras Castle Town are equipped with a TV and heating. Some units have a separate bedroom and a well-equipped kitchenette. A post office is at a distance of 150 feet and the Photo Equipment Museum lies within 350 feet. Free private parking is provided on site. 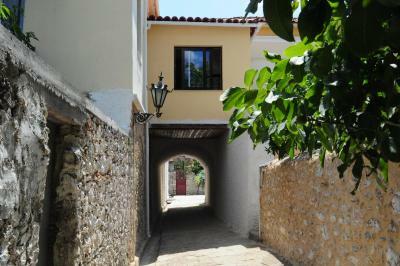 This property also has one of the top-rated locations in Mystras! Guests are happier about it compared to other properties in the area. 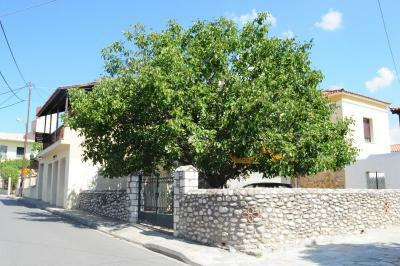 This property is also rated for the best value in Mystras! Guests are getting more for their money when compared to other properties in this city. When would you like to stay at Mystras Castle Town? Featuring a separate bedroom, this air-conditioned apartment enjoys mountain views from its furnished balcony. Offering more space, it comes with a TV in the seating area and a well-equipped kitchenette with cooking hobs, mini oven and coffee machine. This simply decorated room is air conditioned. 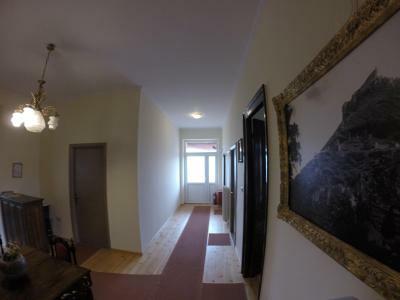 Enjoying mountain views from its balcony, this simply decorated room is air conditioned. House Rules Mystras Castle Town takes special requests – add in the next step! Mystras Castle Town accepts these cards and reserves the right to temporarily hold an amount prior to arrival. There were no shelves in the bathroom and no bowls in the kitchen. The decor is a little dated. The rooms are easy to find, just off the main road into the village, centrally-located, so convenient for restaurants, cafes and shops, and there is on-site parking. 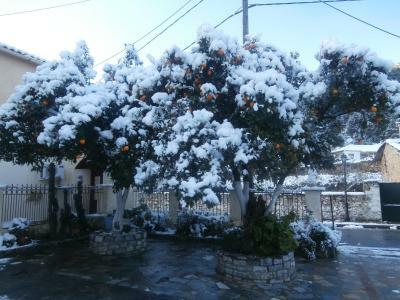 The owners are very friendly and even gave us some oranges and mandarins from their trees. We rented the Family Apartment, which is quite spacious, having a living-dining-kitchen as well as a double bedroom and large balcony. The main room has a third bed, a sofa-bed, and a dining table and two chairs, a well-equipped kitchen with full-sized fridge, electric kettle, coffee-maker, etc. and a flat-screen TV. 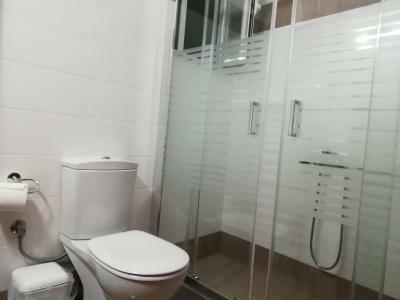 The bathroom is a good size, recently refurbished and nicely appointed, with a large shower with sliding glass doors; there was plenty of hot water at good pressure. The bed was comfortable and there were plenty of extra blankets. The heating worked well, as did the A/C and wi-fi. The balcony has a table and four chairs, and a clothes-drying rack, and lovely views across to the mountains and the archaeological site of Mystras. Room was well appointed. Had all we needed. Shower head could be attached to wall of shower- something we have not often had while in Greece! Clean. Everything looked brand new. The shower that is not attached to the wall. Bathroom a little cramped and without a window. The kindnes and sympathy of the owners. The kitchen for common use. Great location. Everything was amazing. The host was very friendly and helpful. She offered free beers upon arrival and free oranges from the garden. The kitchen was well-equipped and convenient. 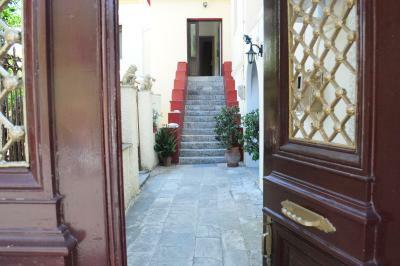 The location is superb - 20m from town square. Exceeded all our expectations and will definitely recommend staying here! It was simply fantastic! This is an amazing find! With the Mystras Castle looking down on you, literally a dozen steps to the Town square, it couldn't be more perfectly located. On top of that this recently renovated, sparkingly clean, family-run hotel is hosted by a wonderful friendly couple. You feel like you're staying with family. The value is amazing, the accommodations are better than you will expect, we will definitely be staying here on our next trip. Everything exceeded our expectations! The photos don’t do this place justice. The staff were wonderful (we were greeted with drinks when we arrived and Elena was very helpful), the room was lovely and the views were beautiful. Our wecolming host made us freshly squeezed orange juice when we arrived. There is also a kitchen you can use. Very cute town with beautiful surroundings. Local tavern in the nearby town is delicious. Very welcoming atmosphere. 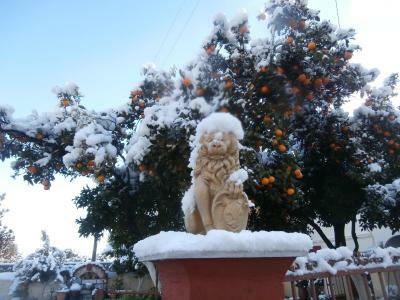 The owner helped us with everything we needed and even gave us freshly pressed orange juice from their garden. I would stay here again! I can’t think of anything, the service was great, clean bedding, towels changed daily, convenient parking. I liked the hostess Elena and her husband, very nice people, the picture of hospitality. Everything was exceptional. The hosts were very kind, the room extremely clean and comfortable, in a nice location.. Overall the only thing we regret is we could spent a couple more days there. Incredibly welcoming hosts. They truly enjoy what they do and pride themselves on their property. They are heartfelt people who make you feel at home and want you to enjoy your vacation. Lovely people. 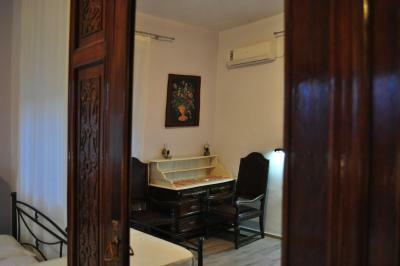 The beds are comfortable, sufficient kitchen, coffee maker, salt and coffee grounds available in room. Full sized fridge that was on when we showed up! Adequate on-site and street parking. Incredible view of castle with sunny South West facing courtyard with Orange trees and comfortable seating. Restaurants and mini market 2 min walk. Hiking trails within 10 min walk-you could spend all day hiking. 15 min easy drive into Sparta for further shopping/dining options. Heater available. Thank you for everything, We loved our experience! Wish we could have had more days to explore! Everything was excellent, from the glass of fresh orange juice from the trees of the garden, to advise for a good place to eat. There is no better place to be found, especially at the price. Excellent value for money. The manager and her husband were always there ready to take care of us and offer a cup of ccoffe, a cookie or a fruit from the garden. And always a big smile. Private parking was an extra bonus, even though space would be limited for a full size car. Excellent location with a spectacular view of the castle. We had booked the appartment, if you are going there book it the moment you see it available, the balcony alone is more than worth the difference.